This is a great pattern to teach a new knitter how to work with double-pointed needles: it's quickly done, and you have something useful when you're finished! Select a pretty yarn, sparkly is nice. Worsted weight will work, but finer yarn would be better. Use double-pointed needles in the size indicated on the label, or maybe a size smaller. Photos show a dress knitted from Jamie yarn on size 4 needles, at a gauge of 6.5 stitches per inch.It is knitted on 32 stitches. Knit a swatch 20 stitches or more wide, in plain stockinette. Figure out how many stitches it will take to give you five inches. Subtract one stitch if necessary to make it an even number. Skirt: Cast on the number of stitches you figured out. Join and knit in the round for 5 1/2 inches (ankle length) or 3 inches (knee length) or 2 inches (short). Ribbing (this will actually start at the widest part of the hips): Work in k1 p1 rib for one inch. 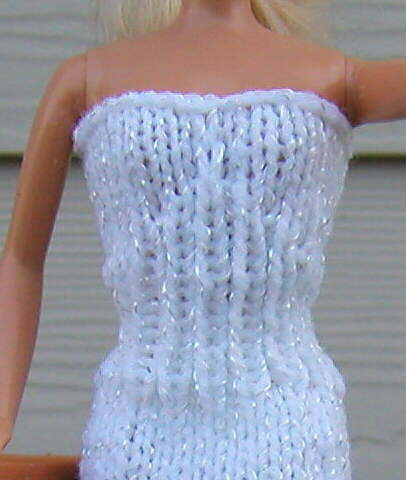 Bodice (click photo for bodice detail): if you don't want to do shaping, just work in stockinette for another inch and bind off fairly tightly (there should be enough stretch to get it past Barbie's hips, but no flaring). To give a bit of shape to the bodice, on the first two rounds (no matter how many stitches are in the tube) do p1, k1, p1, k1, p1, k1, p1 at the center front. On the next two rounds, do p1, k1, p1 at the center front. Then do 2 rounds, slipping the center stitch, knit one round, do 2 rounds slipping the center stitch, and bind off. The slipped stitches pull the dress down a bit at the center.